Bubba is no longer with us. Bubba was our fish. I'm not sure I ever really wrote about Bubba (and the fact that I am not searching for reference links tells you a little about my feelings towards him). I think I had a love/hate relationship with Bubba. I loved the idea of having a fish tank, loved that he was pretty cool looking fish. Hated that he would not leave landscape rocks in tank alone and killed every other fish in the tank so he could have it all to himself. Oh, and he had these piranha type teeth that would draw blood if you were not careful. Bubba has been with us for, gosh, maybe around 10 years? I know, impressive right? He survived a move from one apartment to another and then to our current house. He had been around longer than our kids, our cat and our marriage. He was pretty feisty in his younger days. He was constantly rearranging the tank and he got an occasional treat of smaller fish. 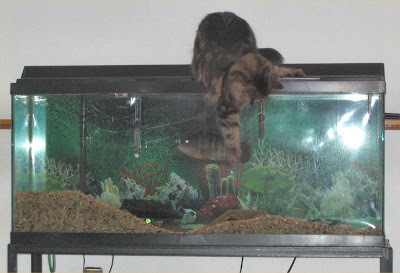 Sometimes he would got moving enough that he would splash water out of the tank. So, as much as I kinda wanted him gone so we could once again populate the tank with lots of pretty fish, I felt bad for the big guy last night. Ryan moved him to a final resting place outside. Hopefully, he is now moving rocks around in the big tank in the sky.